Shakti is the Universal primary Force. As mentioned in the last post, it could be both-constructive or destructive. We are concerned with constructive force as spirituality involves dealing with positive force. Prior to the post on ‘Shakti,’ 3 more articles were written about one more type of force and that was Kundalini Shakti. In those posts I have documented my personal experiences of advancing spiritual stage. In those times I merely got glimpses and visions of some saints like Sri Ramakrishna Paramhansa and goddess Kali of Dakshineshwar. But a visit to the holy city of Dakshineshwar was taken much later. Even before I made a visit, it was my earnest desire to visit the birth places of Ma Sharada, the spiritual life partner of Sri Ramakrishna Paramhansa and the birth place of her husband too. I do not know why this desire was born as I am in no way linked to West Bengal and had no connection or background of people worshiping Kali, the goddess of both- preservation and destruction. 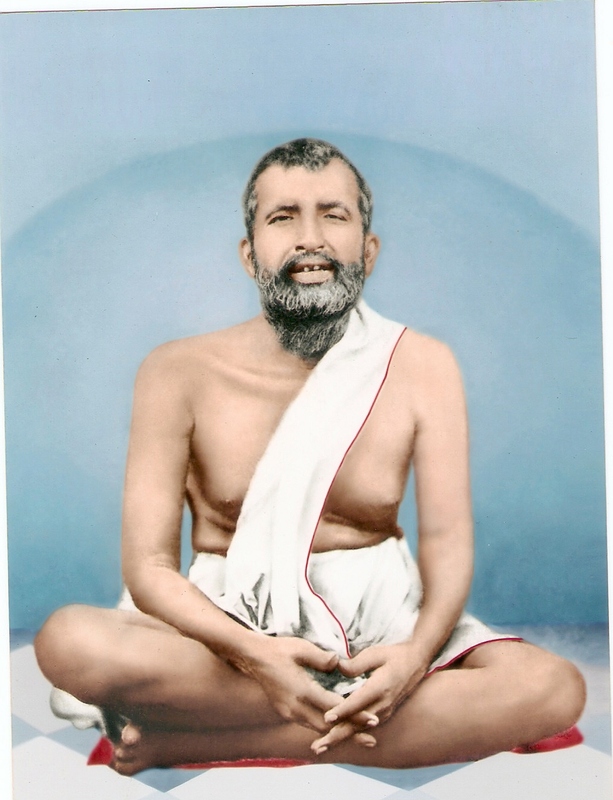 Jairambati is the birthplace of Ma Sharada and Kamarpukur the birthplace of Sri Ramakrishna Paramhansa. Both are about 6 kilometers away from each other in Hoogly district of West Bengal. I have visited both these places twice and have attained high degree of spiritual peace and clarity of thought. In Kamarpukur, I have seen the old house, the courtyard, the more than 160 years old mango tree under which the small house stands even today. It was here that Sri Ramakrishna Paramhansa was born. The small room in which he was born is situated there. The mango tree was planted by him and it still bears fruits. And I have seen the humble mud house of Ma Sharada in Jairambati where she would sit for hours in the courtyard praying and chanting the holy name of Lord Jagannath or the Lord of the universe. Both places still radiate immense peace and vibrations of spiritual message and enlightenment. These two places worth visiting are now under Ramakrishna Paramhansa Mission and are maintained very well, particularly where cleanliness is concerned. Ma Sharada was a symbol of spiritual and divine force. Although she was not able to live with her husband for a long tenure, she helped him and his foremost disciple, Swami Vivekananda in the worldwide mission of spreading Vedanta knowledge in modern times. Shakti can manifest itself in a subdued and mellifluous manner. The dynamic force works quietly unseen to the eyes of people in some cases. Ma Sharada was a perfect example of such a silent force. ‘Naam Smaran’ or remembering as well as chanting of God’s holy name incessantly, repeatedly is a very good tool to trick the wandering mind. When we silently remember God by speaking or whispering or uttering his name at the back of our mind while keeping busy with our routine tasks, the subconscious mind does not absorb the prevalent negative and impure thoughts of people floating in the ether. In this way, we increase our own Shakti or positive power and reduce negativity present in or around us. It is not possible to write the complete life history of Ma Sharada, but I will talk about a few extra ordinary incidents of her early childhood which undoubtedly point out towards divinity that she was born with. Born in a small, quiet village of Jairambati in West Bengal in 1853, Ma Sharada was married to Sri RamaKrishna Paramhansa in early childhood. As the Divine play had, they both led a pious life. Jairambati did not have its own market. It was a very small village with no zamindars or rich people but the villagers celebrated all festivals with Harinam kirtan, Kali Pooja, Shitla devi pooja, Durga pooja and mythological religious plays. Her birth was in a devout, humble Brahmin family. The father was generous and helped everyone who came to him asking for help. Her mother worked in the fields where they grew cotton. Her mother’s nature was of firm determination and she was a pious lady. She was very simple and compassionate and she used to feed many people in the villages nearby as well as people in her own village in times of famine and drought in spite of lack of funds at home. The child was showered with love and affection from parents and uncles. As a girl, Ma Sharada was quiet, sober and diligent. Though the family was not very prosperous, her parents were very helpful and generous. Thus the sowing of seeds of virtues in the sacred heart of the little girl took place very early on in her life. An extra ordinary event is associated with Ma’s birth and her arrival. Once her mother went out for a nature’s call near a pond in the evening. There was this sacred tree of Bilvapatra near the pond. She saw a very beautiful divine girl of about 5-6 years old swinging on this tree. The girl came down with soundless footsteps from the tree’s branch after which she soon disappeared. On that night, the pious mother felt that a big Force had entered her womb because of which she became unconscious. Such was the power of the Force. At this time Ma Sharada’s father was in Calcutta. After having lunch that day thinking of mundane things he fell asleep. He dreamt that a small girl with a golden glow has jumped up and clung to his back and wrapped her arms around his neck. The girl’s looks were extraordinary and she was wearing glittering ornaments. The Brahmin father asked her, “Who are you?” The girl answered gently, “I have come to you, receive me” After he awoke, the father felt he had a darshan of Goddess Laxmi with all the divine aura present around her. Q- “Ma, whenever I sit for japa-meditation, why am I am surrounded by all types of worries? Do something by which I may forget all my worries”. 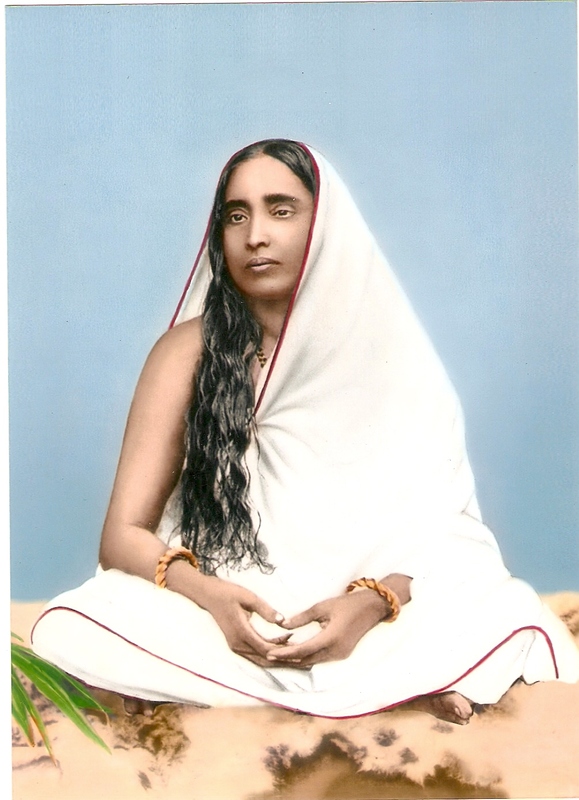 She has also told her disciples in those days that the Shakti of the Guru lies in the mantra given by him or her. Through mantra it reaches the disciples. The sins of the disciples are absorbed by the Guru. Hence after giving mantra to the chela or disciple, the Guru takes on the karmas of his disciples and his body gets diseased. Dear readers, such is the power of a Self realized soul and a divine servant of God because of which we are able to bear the weight of our karmic consequences and are in turn able to achieve the kingdom of God. This entry was posted on Thursday, July 1st, 2010 at 11:27 pm and is filed under Uncategorized. You can follow any responses to this entry through the RSS 2.0 feed. You can leave a response, or trackback from your own site. Wonderful to read this post. I do chanting but need to increase the duration of my chanting. I also love many masters and tend to chant say 5 different mantras in a day to show my love to each one of them. I know it’s better to stick to one mantra but somehow not sure which one mantra is specifically best for my soul to chant now for material and spiritual progress + God’s Guidance, Grace and Protection. Keep on doing whatever chanting you are doing these days without any interruptions. Let the time become ripe and everything will fall in right place. It is all about time becoming favourable. Go with the flow. Chanting will clean the passage and it will also purify your future path. Whatever is happening now with you is because of your past, allow it to pass peacefully. Have complete faith in the mercy and redemption of God and Gurus. Keep your mind still and fill your heart with just gratitude and the storm will blow over….. Thank you dear mom for your reply. The chanting still continues to this day. Inspiring to read about Ma Sharada. While reading this post I asked her help on chanting mantras . I am glad I was a part of some of your early travels. I didn’t appreciate the value of such places then. It may not be possible to go again, but if God permits, I would want to go back again. I feel japa must be done consciously. I notice many people who remember mantra or even entire scripture by rote but their mind seems to be away when they do their japa or paath. Sometimes if I do my own naam jaap for a long duration, I feel its not done as consciously as it should be- daily life activities impinge. Dear Mandira, quite true we sometimes do not understand the real value of God given great opportunities to learn something so important and priceless from them. Nevertheless you have those memories and you can always go back to them and pray mentally to Ma Sharada where ever you are today and do your japa. Now listen to me carefully. It is not advised to do japa for hours, you are suggested that you should do japa more consciously and intently, it is this that will give you a lot of benefits. After you embed your mind deeply with the vibrations of some mantra, holy name or shloka, the mind gets clear and past tendencies are removed slowly and invisibly.This is of prime importance. If you get hassled or disturbed by constant negative activities or mental thoughts of someone, you can always go back to your japa and bring back your agitated mind to a calm state. Practice this and come back to me after sometime after you see improvement in your state of mind. I started Japa only some months ago and found it is really great technique to calm the mind. So comforting to read his post again tonight. I really love this post. It was through this post that i came to know about Sharada Ma and her life. Infact till date i have not read about her anywhere except for SpiritInLife blog. I wished there was more post on her and other divine feminine role models like her. A big thank you to the Holy Gurus because of whom you finally emerged and became known to the world. Thank you for being a blessing in so many lives. I was wondering how many females who have reached the pinnacle of Spirituality have not come to fore at all. Their life, struggle, strength… that they portray.. can affect so many of us in a positive way. Thank you for this post. Very glad to read it !